Published Mar 12, 2015 by Peachpit Press. Part of the Learn by Video series. 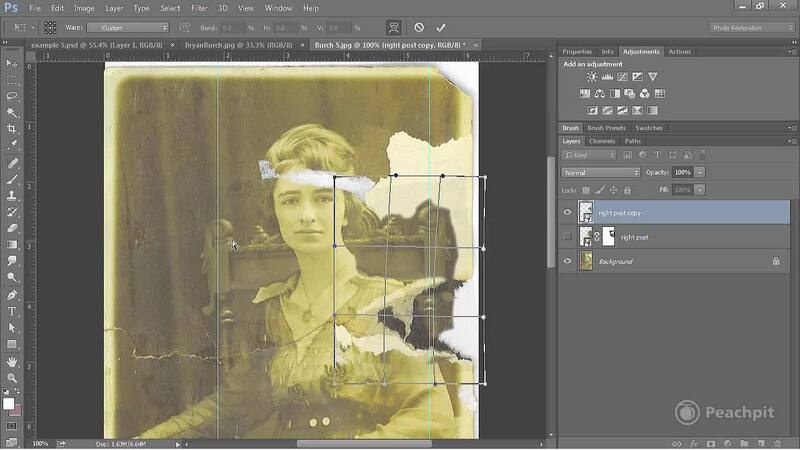 With the emergence of digital editing software and growing interesting in genealogy with companies like Ancestry.com, interest in photo restoration is on the rise. In this video, photo restoration expert Bryan Burch covers the basics of this important topic, from importing your images to analyzing the damage and making corrections in Adobe Photoshop. After showing you how to get started by setting up your workspace, he’ll cover all the techniques you need to know to repair and preserve your images, including: making adjustments with the Clone Stamp tool, Spot Healing brush, and Content Aware Move tool; correcting exposure with the Camera Raw filter; adjusting colors by correcting white balance and adjusting saturation and detail; fixing imperfections such as scratches, specs, and dust; removing stains; and more. With his characteristic friendly and approachable style, Bryan walks you through several example images throughout. He wraps things up by showing how to make the final touches to your image and save your files for easy retrieval and printing. The video is wrapped in a unique interface that allows you to jump to any topic and also bookmark individual sections for later review. The unique “Watch and Work” mode shrinks the video into a small window to allow you to work alongside in Photoshop as you view the video. Project files used in the lessons are included so you can practice what you’ve learned. At the end of every lesson, you can test your knowledge by taking interactive quizzes.